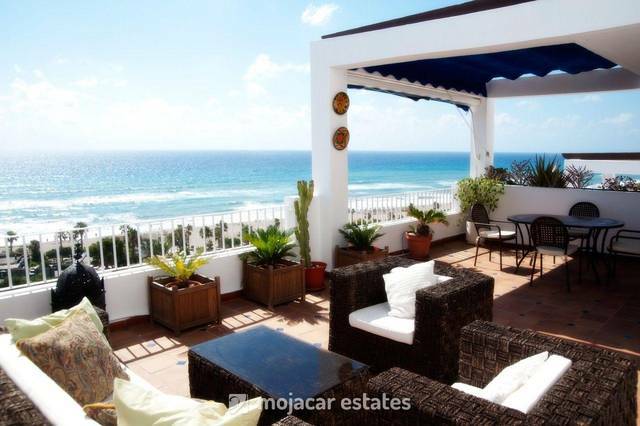 ALBOROKE GER Lovely apartment sleeping 4 with shared swimming pool and excellent sea views located in calle Llano del Abejorro approximate 300 metres to the Cueva del Lobo roundabout and the sandy beach of Las Ventanicas. There is a master bedroom with double bed, ensuite bathroom, air con unit , 2 built in wardrobes and patio doors opening out to terrace. The second bedroom has 2 single beds, ceiling fan, built in wardrobe and just opposite is the shower room. The kitchen is equipped with fridge-freezer, ceramic hob, oven, microwave, washing machine, Senseo coffee machine (individual doses required), toaster and kettle. The lounge has 2 sofas, dining table with 4 chairs, flat screen television, DVD, air co unit and patio doors leading out to terrace equipped with dining table and chairs, sun umbrella and 2 sun loungers. Beautiful mountain and sea views. Community swimming pool.